[Para una versión en español de esta entrevista, favor de hacer clic]. 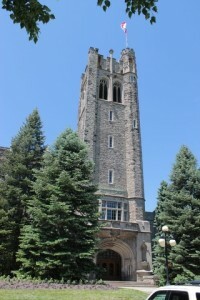 Elika Ortega is a PhD candidate at the University of Western Ontario, Canada. She is a member of the Cultural Complexity and Digital Humanities laboratory (The CulturePlex) and the Red de Humanistas Digitales (Mexico), amongst other projects. Ernesto Priego: Can you describe who you are and what you do? How is your work related to the digital humanities and/or how do you understand the work of the digital humanist? 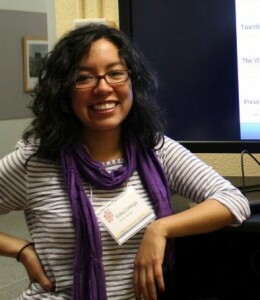 Élika Ortega: I am a PhD candidate in Hispanic Studies at the University of Western Ontario. I work at the CulturePlex Lab where I supervise the content production for a number of projects including databases, websites and software developments. I was also editor in chief of literature at Entrehojas, the department journal, for the 2011-12 period. My academic background is in literature and my own research interests remain pretty literary although I have turned to digital means of producing, distributing and reading literary narrative. Really the question that puzzles me is how literature persists and gets adapted to whatever media we submit it to. I wouldn’t say my work is related to the digital humanities so much as it is only possible as it is because of the computer-humanities duo in, at least, two ways: the media used and the objects of study. Regarding the media, some of the projects I take part in would not be possible without the digital/computational component: there wouldn’t be a journal to edit if it weren’t for the OA (open access) platform we use, and there wouldn’t be content to design if the mobile app for teaching/learning Dr Glearning didn’t exist. There would be other means and maybe the same contents in other forms, of course, but it would be something else than what I specifically do. The second one is the study of digital cultural objects that would not exist in their present form or have the same development and implications if it wasn’t because of their digital component. Again, maybe they would still exist but it wouldn’t be exactly the same. Having said that, I guess I see the work of the digital humanist as an in-progress and forward looking endeavor. Proposed means of study come up all the time and new digital objects of study are created constantly. It seems to me that very few things have been established in DH and I feel like we are, in some way, learning how to be digital humanists. EP: Can you tell us about your personal and professional experience as a Mexican scholar in Canada? What are the main differences between the two academic systems, and was there a particular “academic culture shock” that you may have had? EO: I never did digital humanities in Mexico, so my first academic culture shocks happened in more “conventional” aspects of academia. Realizing the cost of education was one. But the biggest one was the availability of resources in the form of books at the time I moved here, and in a way it continues to be so now with other kinds of resources like people to work with. That was the biggest academic culture shock when I became involved in DH, working closely with people from other disciplines (computer scientists mainly) and learning how to have a conversation with them. EP: In my own personal experience, computer scientists and people with other non-humanities academic backgrounds who are involved in digital humanities projects tend to be much more fluent in humanities topics and approaches than us people with a humanities academic backgrounds are in computer science (or simply coding). There is a certain tendency (that I often call “The Busa Effect”) of some humanities people to think of those doing the computing bit of digital humanities projects as subservient to the “higher” scholarly goals of humanities research. How have you experienced this? Are we still talking of two different academic cultures, or is there hope for the humanities to become more hands-on about technology? EO: Your first point is definitely true. When I first started doing DH I took a course on Python and I could tell I was much more lost than my computer scientist colleagues were at a literature class. Or maybe everybody is bound to get that impression outside of their discipline. At this point and as an insider, I don’t really see two academic cultures anymore but there are specialities, of course, as there always will be. The way I have experienced it, making the effort to become a digital humanist is through the acknowledgement of my own limitations but also of everything I have to offer to a project. I’m very lucky that in the projects I work on there is an almost codependence between content (as humanities) and form (as development) so there’s no “competition” between disciplines.We have done this consciously. The binaries are still difficult to get rid of and that certainly reflects that there isn’t a complete integration yet, but I’m not sure that’s a bad thing. I like to think about it as something I learnt during my literature courses as an undergrad when my profs insisted so much on the form-is-content and content-is-form principle. As for the last part of the question, I don’t really know what to answer. I see hope because I’m an optimist and because I like what I do and see its potential. But I also see people resisting the idea of using technology – interestingly not because it’s not as high as humanities, but the opposite as too lofty and inaccessible. This is a very defeatist attitude and it goes hand in hand with the idea that the humanities are doomed. So really it comes down to a willingness and deliberate effort to be more hands-on about technology, and the realization that it’s only the humanist job to keep their discipline relevant and engaging. EP: Can you tell us a little bit more about your work at Entrehojas, and how you see the journal engaging in the future with the online journal landscape on the one hand and Hispanic studies on the other? Do you know much about its readership and whether it is read in Latin America for example? EO: Entrehojas is really one of the dearest projects I have ever worked on, specially because I’ve been involved in it since its origins. At the beginning, my colleagues and I realized we needed to think about something new, literally everyday: the name of the journal, submission policies, types of articles to be published, languages, sections, issues of licensing, etc. many of which had to be decided right then because of the call for papers on the one hand and layout of the BePress platform, which is flexible but only up to a certain extent. Making those decisions isn’t easy and it’s been a huge learning experience. I’ve had pretty much every possible position in the journal, from proofreader to reviewer to editor. At the beginning of the project I really had no idea how to do any of those, and now three years later it’s really nice to see it taking shape. The idea of making it an OA graduate student journal, from the start had the purpose of establishing a training space both for the editorial committee and the authors as well. It wasn’t long before we realized there is a lot of relevant material that wasn’t entering the journal landscape because they’re “grad-school papers”, but which have their place in the academic ecology and all of them have something to contribute to their subjects’ scholarship. Now, one thing is knowing that as a hunch, and a different one to see it in action. During the year I was editor in chief I became aware of the circulation of the journal, which turned out to be a huge surprise to everybody. We realized the number of downloads was much higher than everybody expected (partly because we never projected it). Since the publication of the second issue at the beginning of April, for example, all of the articles have been jointly downloaded close to thousand times. So, there is definitely a niche for the kind of manuscripts we publish, and the medium, no doubt, helps the material find its audience. Editing a Hispanic Studies journal in Canada is a weird thing, and doing it open access is the only way it make sense if we are to engage outside of our little local community where the discipline is more widely practiced like Latin America. The BePress system provided by the Western libraries where Entrehojas is hosted has been a really comfortable platform to work with but it has some limitations as to the analytics of the site, so unfortunately, I don’t really know where the journal is being read. The only hint I have is where the manuscripts come from (a lot from North America, some from South America and few others from Europe), which gives us at least an idea of how far the journal might be travelling. There is also a lot of “word of mouth distribution” and social networking too aiding the development of the journal, which is also very exciting because it is very much in tune with community formation in DH. EO: I want to thank you for the interview. It’s been really nice to have a chance to talk about my work and how I view it in relation to the broader DH sphere. Although this seems to be changing, at Western, DH are still a bit in the background and when you add the Hispanic Studies aspect into the mix, the question audience really becomes an issue. Hopefully the work being done by everybody involved in RedHD helps us reach more people and contribute more broadly to the field.